'Ketu' is a planet that is unique to Vedic astrology. 'Ketu' can be considered to be a mythical planet, as astronomically there is no such planet in the solar system. However, do not mistake mythical with non-existent, as Ketu's effects are very real. 'Ketu' and 'Rahu' are twin planets that are described as being the dragon's or serpent's tail and head, respectively and are essentially malefic in nature. When these two planet form a certain aligment such that they encompass the remaining planets in a chart, they are considered to form a 'Kal Sarp Yog'. This aligment is generally considered to be inauspicious as this tends to cause hardships and struggles, depending on the house that it aspects. As explained above, 'Ketu' is the dragon's tail and in ancient Hindu mythology, 'Ketu' belonged to the demonic domain. During a struggle between the Gods and demons to claim a pitcher of the elixir of immortality, Lord Vishnu severed Rahu's head from his body and all that remained were his head (Rahu) and tail (Ketu). However, Lord Shiva compensated 'Rahu' and 'Ketu' for the harsh punishment inflicted upon them by making them a part of the nine Vedic planets, or the 'Navgrahs'. In Vedic astrology, Ketu is often described as being a 'Shadowy' planet. This is in part a reference to the effects of this planet. 'Ketu' belongs to the Saturn group of planets and 'Ketu' is also considered to be able to cast a shadow over the Moon, depending their placement in a chart and their respective degrees of strength. 'Rahu' and 'Ketu' are the sworn enemies of the Sun and the Moon. 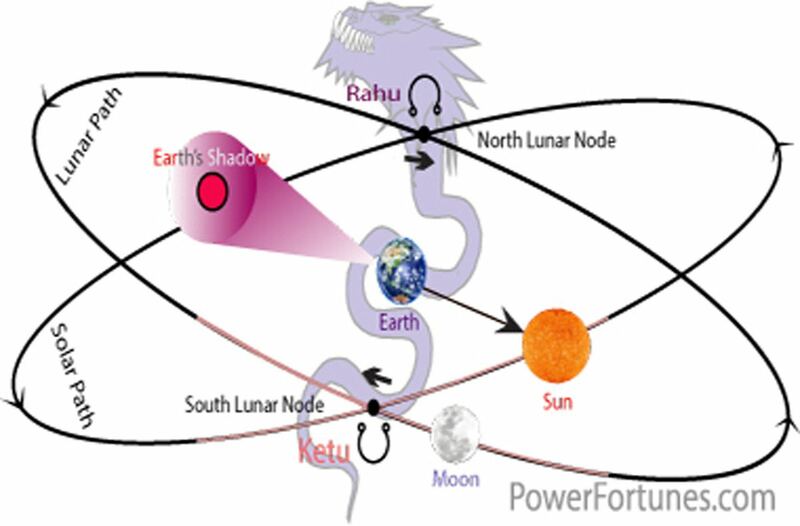 'Rahu' and 'Ketu' are also known as the respective ascending and descending lunar nodes, as they are the intersecting points in the celestial orbits of the the Sun and the Moon. That is, the points at which the celestial orbits of the Sun and the Moon intersect in space, with Rahu being the Northern node and Ketu the Southern. Just as 'Rahu' is believed to swallow the the Sun during a solar eclipse, 'Ketu' is believed to swallow the Moon during lunar eclipse. There is no actual planet in the solar system that corresponds to 'Ketu', while 'Ketu' or Dhumketu is the Sanskrit word for comet. This is probably because of the correlation between Ketu's mythical description and the stream of gas and dust that form a comet's tail. However, some schools of thought hold that 'Rahu' and 'Ketu' are something else altogether. 'Rahu' is thought to be akin to a black hole that swallows everything. According to the mathematical models that describe black holes, white holes are the reverse of their black namesakes. That is, they are thought to eject the material that falls into the black hole, such that not even a single particle of the ejected material falls in the vicinity of the black hole's event horizon. In effect, a white hole would be the opposite end of it's black hole. So if we were to extend the 'Rahu'-black hole analogy further, 'Ketu' would be a white hole, as it is Rahu's tail. As of now, no white holes have been detected in the known universe and they are purely mathematical hypothesis, but then again, 'Ketu' is a purely mythical planet! Transits of 'Ketu' are generally marked by uncertainty, worry and frequently changing fortunes. However, not everything associated with 'Ketu' is bad, as when this planet occupies the XIIth house of a natal chart, this indicates that the individual has come to the end of the birth-death cycle. That is, the individual has worked off their 'Karmic' deficit, will take no more births and will remain in eternal bliss with the 'Almighty'. In Sanskrit the Dragon's Tail is called 'Ketu' and this name is used in Vedic astrology. Ketu is also a shadowy planet, and denotes Mars. It signifies cleverness, dexterity, divine and supernatural strength, assertiveness, fame, social esteem, difficulties, uncertainty, tensions and turmoil. Ketu is also representative of supernatural forces. Ketu does not rule over any zodiac sign. It is exalted in Sagittarius and debilitated in Gemini. The corresponding gemstone for Ketu is cat's eye. The main health problems brought on by 'Ketu' are eye problems, stress internal ailments. The corresponding colour for 'Ketu' is grey. According to numerology, Ketu's number is '7'. The direction associated with Ketu is, West. The corresponding talisman for Ketu is the 'Ketu Yantra'.